It's that time! Time for the next month's challenge! You submitted, you voted, and your winner is... extremeplant! Congratz! Please keep in mind he/she cannot make a submission for the next month, November. Please be on the lookout for the November Submissions and enjoy the LIMITED TIME October challenge. You must complete the challenge before the end date in order to proudly use the October 2018 Badge. Theme - Trick Or Treat? 🎃 Watch an anime with the Yandere OR the Sweet Touth TV Trope. 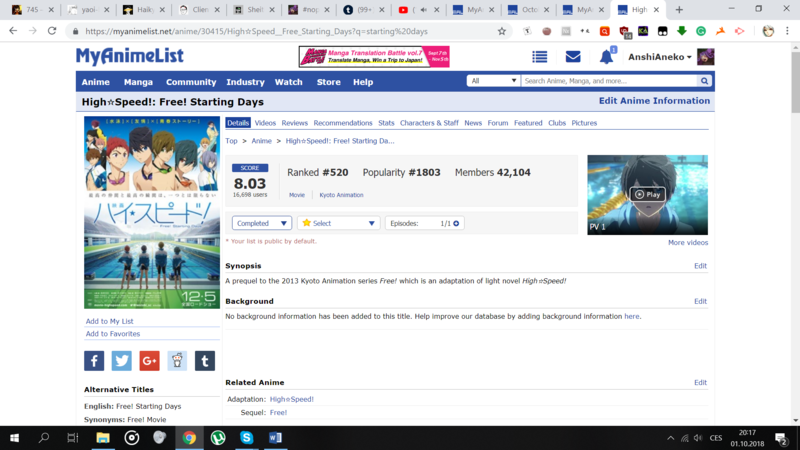 🍭 Watch an anime with a score below 6 OR above 8. 👻 Watch an anime with 24+ episodes OR a movie. 🍬 Watch a Horror OR Comedy anime. It's that time! Time for the next month's challenge! You submitted, you voted, and your winner is... extremeplant! Congratz! Please keep in mind he/she cannot make a submission for the next month, June. 🍭 Watch an anime with a score below 6 OR above 8: Haikyuu!! 🍭 Watch an anime with a score below 6 OR above 8: There She Is!! Watch a Comedy anime: Ladies versus Butlers!